We at Foot & Ankle Reconstrution of North Georgia believe that informed patients are better equipped to make decisions regarding their health and well being. For your personal use, we have created an extensive patient library covering an array of educational topics. Browse through these diagnoses and treatments to learn more about topics of interest to you. Or, for a more comprehensive search of our entire Web site, enter your term(s) in the search bar provided. 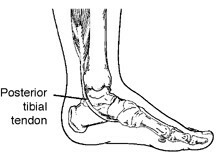 PTTD is often called “adult acquired flatfoot” because it is the most common type of flatfoot developed during adulthood. Although this condition typically occurs in only one foot, some people may develop it in both feet. PTTD is usually progressive, which means it will keep getting worse, especially if it isn’t treated early.